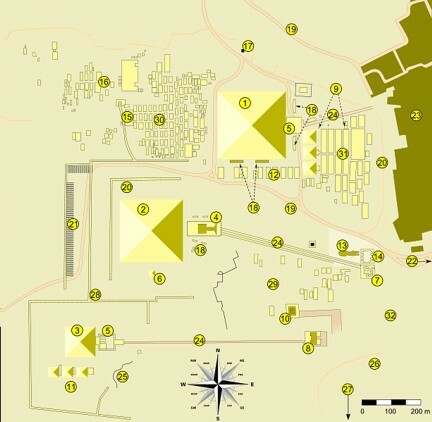 Giza o Guiza (en árabe, الجيزة Al-Ŷīza, pronunciado Al-Gīza en dialecto egipcio) es una ciudad de Egipto en la orilla occidental del río Nilo, situada a unos 20 km al sudoeste del centro de El Cairo y que hoy, de hecho, forma parte del área metropolitana de la capital egipcia. Es la capital de la gobernación del mismo nombre. Cada una de las tres grandes pirámides tenía su propio nombre, que designaba también a la necrópolis que la circundaba. El horizonte de Keops, Kefrén es grande y Micerino es divino. Durante el reinado de Keops fue cuando la meseta de Giza alcanza gran relevancia. Giza or Gizah (Arabic, الجيزة, transliterated al-Gīzah; pronounced in the Cairene dialect of Egyptian Arabic eg-Gīza; also sometimes rendered in English as Gizeh, Ghizeh, or Geezeh) is a town in Egypt on the west bank of the Nile river, some 20 km southwest of central Cairo and now part of the greater Cairo metropolis. It is the capital of the Al Jizah Governorate, and is located near the northeast border of this governorate in coordinates 29°59′00″N, 31°08′00″E. It is located right on the banks of the Nile River. Its population is 4,779,000 (1998). Giza's most famous archaeological site, the Giza Plateau, holds some of the most astonishing monuments in Egyptian history. Once thriving with the Nile that flowed right into the Giza Plateau, the Pyramids of Giza were built overlooking the ancient Egyptian capital of Memphis, which was near modern day Cairo. The Giza Plateau is also home to many other Ancient Egyptian monuments, including the tomb of Pharaoh Djet of the First dynasty as well as that of Pharaoh Ninetjer of the Second dynasty. The city itself has seen some changes over time. Changes in infrastructure during the different occupations of Egypt by various rulers, including the British in the 19th and early 20th century, focused on the construction of roads, streets, and buildings in the area. It is commonly misunderstood that the Giza area is a complete desert area; however, Giza has become a thriving centre of Egyptian culture and is quite heavily populated, with many facilities and buildings in the current area. Giza saw much attention in particular to its vast amount of ancient Egyptian monuments found on the Giza Plateau, and has astonished thousands of visitors and tourists over the years. Giza's infrastructure saw much attention from both the British government prior to the 1952 coup d'etat, as well as the current Egyptian government due to the city's importance in tourism. Parts of Giza include Alharam famous in the past for its night clubs, Zamalek predominantly populated by middle class Egyptians and relatively recently overpopulated Almohandeseen.